Majorca, sometimes spelled Mallorca is a wonderful Balearic island off the coast of Valencia, Spain. Every year it is visited by thousands of tourists who want to enjoy the delights of the island and sample its culture. Thanks to its origins the culture is diverse and there are plenty of amazing views to savor, sunshine to soak up, and things to do and sights to see. This is made all the easier as regardless of whether you’re using a Majorca taxi services firm or relying on public Majorca transport you can see everything Majorca has to offer quite easily. Majorca is well served by taxi firms and one phone call and you can find your way traveling to Cap Formentor in the north of the island or Magaluf in the south. There are plenty of reliable taxi companies. The drivers tend to be locals with good knowledge of Majorca’s quieter roads so they can use shortcuts to get you to your destination sooner. Many travel with ROIG who are both trusted and respected. Busses are frequent on Majorca and if you don’t mind longer journeys then why not take a bus to Pollenca and other delights of the island. Busses tend to go everywhere and as such journey times are longer. Nonetheless, with good planning, you can catch a bus and spend a day in a quaint town or village that you never knew existed. The busses do not run 24 hours a day, however, so if you want to have a bit of a late night you’re going to need to phone a taxi cab to get home. As well as taxi services and busses you may want to hire a car to see the island. Hire cars firms are quite plentiful so getting behind the wheel and whizzing off to see all corners of Majorca is easily accomplished. The downside, of course, is that you’re the driver so you may get lost without good map reading skills or good digital tools. As the driver, this means you cannot enjoy the fine drinks you will find in Majorca’s bars and clubs. This can be disappointing given that the nightlife culture on Majorca is strong. That said, getting around by hire car is a viable option, maybe allow a little longer for journeys unless you know the island well. Majorca is well known for its cycling. Thanks to its comprehensive smooth road network it is easy to cycle from one point on Majorca to the other. Even if your fitness is not the best and you are staying centrally, there will be a point of interest such as a quaint town or village within easy reach. Cycling is a great way to experience the island as you simply don’t miss any of it. The island is blessed with orange and olive orchards that line the slopes of the Tramuntana Mountain Range. Cycling makes you feel part of this land. Majorca is predominantly Spanish but it’s Arabic and Roman roots are visible too. In fact, walking through some of the narrow streets of the towns and villages gives you a feeling that you are walking back in time. There are plenty relics of the past such as the Old Town of Alcudia. Here you will see city walls built by the Romans and get a flavor of walking through narrow streets such as those of Morroco. 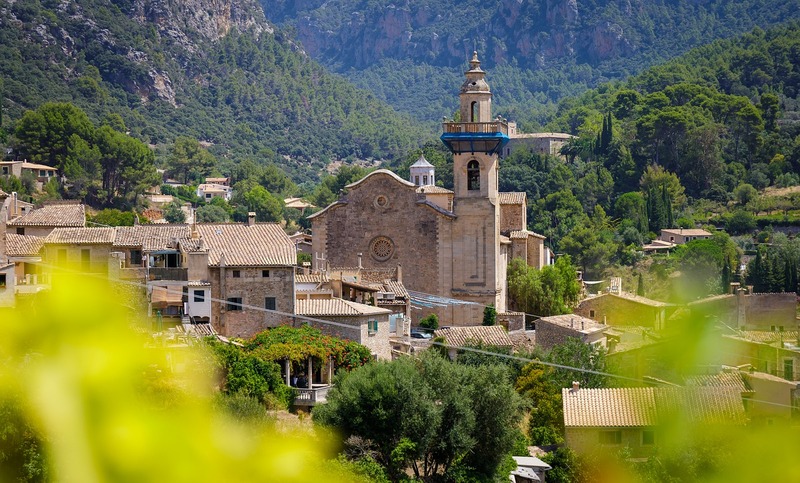 Take a trip across the UNESCO protected Tramuntana Mountain Range and you are in for a treat. People live on the mountain range and so visiting villages and towns is a must. Each one has its own flavor and many have great places to eat and take coffee. Some have vibrant markets to savor. Two standout gems of the mountain range are Puig Major the highest reachable point on the island and the town of Soller. Amazing views and equally amazing selfies are a must at the Puig Major summit. Views of the ocean and the island will take your breath away. While the town of Soller provides a contrasting experience. Here the beach features golden soft sand and gorgeous clear water. It has rocks to explore. One of the great aspects is to reach it you descend down Sa Calobra which is a hairpin road caved into the mountains. You can also reach it by ferry. Either way, the journey is worth the effort and a great beach day await you. Alternatively, you can take a taxi out to Cap Formentor and savor the ‘meeting point of the wind.’ You can marvel at the lighthouse and enjoy views of the ocean and the whole northern side of the peninsula for a great sense of scale. Wherever you go on the island Majorca transport has you covered. Using cabs, busses, and hire cars you can reach any place and savor it. Taxis are arguably the best transport as all you have to do is sit in the back and take it all it in. Perfect for any holiday. Why not explore these Game of Thrones filming locations while you are in Spain? Looking for more of my travel tips? Check them out here.